We hear the stories all the time -- a child can barely get through the day because he's been harassed and tormented by mean texts, Facebook posts, or by a website created for the express purpose of humiliating him. Well, recent findings from the Cyberbullying Research Center reveal that "cyberbullying victims were almost twice as likely to have attempted suicide compared to youth who had not experienced cyberbullying." The devastating effects of cyberbullying were also confirmed by The Journal of Adolescent Health. Their newly-released survey results revealed that kids who are cyberbullied tend to feel "isolated, dehumanized, or helpless." Based on responses from over 7500 6th through 10th graders, the study also found that cyberbullying leaves the perpetrator unscathed, while the victim often ends up feeling depressed. The National Crime Prevention Council has some excellent information on responding to cyberbullying. Click here to find out what you can do. If you are a parent or teacher, share this information with your child. Cyberbullying is a fast-growing, insidious epidemic that's affecting more kids than we even know. My warmest thanks to all the teachers across the country who've offered to participate in the research study of No Kidding About Bullying. There are so many people wanting to take part, and I wish we could say yes to all of you! However, there are no longer any openings for the study. We may do a Part 2 after this one, so look for future notices in upcoming blog posts and newsletters. 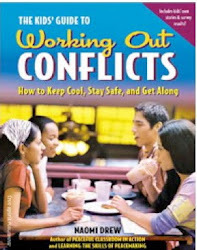 The book is available to everyone at http://bit.ly/no-kidding-about-bullying, and if you decide to use it with your class or group, I would love to hear about your experiences. I am about to launch a No Kidding About Bullying blog. Anyone using the book is invited to post their thoughts, questions, and writings (including student work). 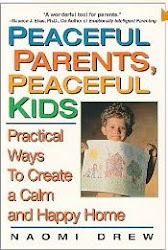 I will let you know as soon as the blog is up. By the way, click here for a free session from No Kidding About Bullying on helping kids deal with exclusion and rejection. You can download and use right now. If you are a parent, feel free to pass it on to your child’s teacher. 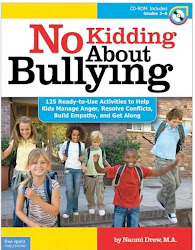 For an online interview I did with Education News on No Kidding About Bullying, and a free poem from the book, click here. For my latest Examiner article, “Does Your School Foster Compassion and Kindness? ", click here. You can post comments at the end of the article, and, as always, I invite your thoughts! What are you doing to foster compassion over cruelty? I’d love to hear your thoughts. Post your comments, questions, and stories below. Kudos to Governor Paterson for making New York the 44th state with an anti-bullying law firmly in place. This Dignity For All Students Act safeguards kids from being bullied due to race, color, weight, sexual orientation, gender identity, national origin, ethnicity, religion or disability. Assemblywoman Donna Lupardo, a sponsor of the bill said, "Clearly defined anti-bullying policies will help students identify bullying when it occurs and understand its consequences." The bill requires all schools in the state of New York to be free of discrimination, bias-based bullying, and harassment of any kind. "We're going to take a historic step to make sure that all schools are transformed into havens of understanding and protection," Paterson said. To see if your state is one of the 44 that has signed into law anti-bullying legislation, go to BullyPolice.org. You'll also be able to see how your state's legislation is ranked. If your state has not passed anti-bullying legislation, make some noise. The more voices speaking out, the sooner things will change.